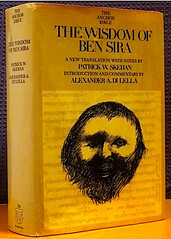 Title: The Wisdom of Ben Sira / A New Translation with Notes / By †Patrick W. Skehan / / Introduction and Commentary / by Alexander A. 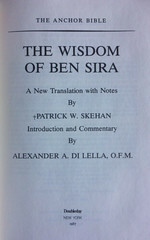 Di Lella, O. F. M.
Contents: Wisdom of Ben Sira •• The Apocrypha • Preface • Contents • Principal Abbreviations • Introduction •• Index of Authors • Index of Subjects. Comments: Hard cover large octavo with DJ; sewn binding. XXIV & 624 pp; translation & notes start w/ p. 129 through 580. The translation is a revised adaption of P. Skehan´s unfinished version, which he originally had prepared for the New American Bible. Source texts: All availbale Hebrew and Greek Witnesses, Göttinger Septuagint; Old Latin, Syriac. The Franciscan Father Alexander A. Di Lella wrote the 3-page Preface, dated Washington D. C., Feast of Jerome, September 30, 1985. There he tells the history of the Translation done by Prof. Patrick W. Skehan. Skehan had finished it shortly before his illness which eventually lead to his death a few days short of his 71st birthday on Sept. 9th same year. Skehan beforehand had asked Di Lella to prepare the introduction and commentary. Alexander A. Di Lella (* … CT (U.S.A.) 1924) Father O.F.M.